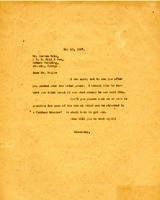 Martha Berry writes to B. M. Hall to tell him when she will and won't be present at her home and the Berry Schools. 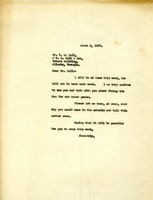 She is anxious to see and speak with him about fixing the dam for the Schools' water power. 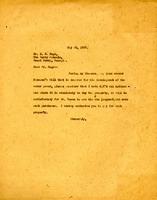 This is a letter to Mr. Warren Hall apologizing for not seeing him after he looked over the water power. Miss Berry asks for his thoughts about it and what he thinks the next steps should be, and also asks about the name of a shovel which could be attached to a Fordson tractor. 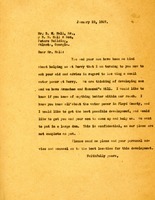 Martha Berry writes to Mr. Liebold telling him that they would send the Engineer Report on the water power that Mr. Ford had asked about when he was visiting Berry. 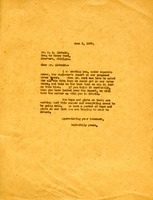 Martha Berry writes Mr. Hall to ask for his advice and counsel as to her incomplete plan to build a water power generating station at Berry.